Unless we’re talking about super lean people, about the last thing any climber wants to do is get bigger. The bigger you are, the more you weigh, and the harder it is for you to climb. 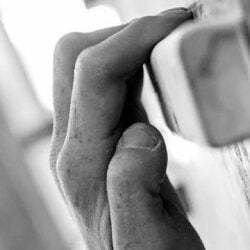 But climbers can really benefit from creating more mass in the forearm musculature; it helps improve finger strength and it can improve your endurance significantly, as well. The problem with most climbers is that they’ve already got highly developed forearms. So…how to make them bigger? When we train for forearm hypertrophy, it’s a painful, slow, and hard-training phase. You’re also probably not going to climb too much or too well during this time of the year. If you want bigger forearms, though, you have got to do the work. Look at it this way: you’re saving up for the future. When we look at adding more training time, it’s not overall training time, it’s hypertrophy-focused training time. 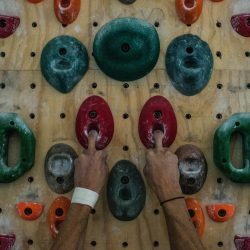 You probably spend a couple of hours bouldering in the gym a couple of nights a week. That’s four hours we can spend getting thicker. Spread this out between 3 or 4 workouts, and you’re in business. Keep in mind that the primary factor in hypertrophy training is more time under load – look at how much time you spend with your forearms flexed each week, and turn it up by 20-50%. Climbing is a great forearm workout, but I didn’t need to tell you that. However, climbing works the forearms in just one way: isometric (or static) holds of the flexor muscles. We want to add more movements and different contractions. This is because isometric training has been shown to be very bad at creating mass in the muscles – the reason that even full-time climbers can still be seen with very skinny forearms. What you’ll want to do is add as many movements and contractions as possible to your workout. We look for 5 exercises per workout, and do 5 or more sets of each. You’ll want to scale the resistance to force your muscles to contract a total of 20-25 seconds per set. This means a 20-25 second hold if you’re doing an isometric exercise, or about 10 two-second repetitions if you’re doing a concentric/eccentric move. Over the course of your hypertrophy training cycle, you want to see the total load increase each week. That means when you multiply workouts x exercises x sets x reps x weight, the huge number you come up with should increase by about 10-15% each week. Just forgetting this rule alone will railroad most training plans. Keep good records, and you’ll see big gains. Hypertrophy training (for rock climbers) is best accompanied with other “limiter” workouts. 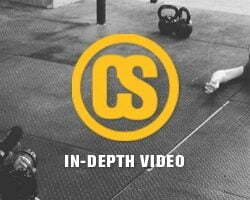 Do some core work, some mobility and stability exercises, or do some medium-intensity bouldering. If you’re climbing, try to get sickly pumped several times during a workout (take care to avoid climbing poorly during this training, as your body learns bad form as easily as it does good form). 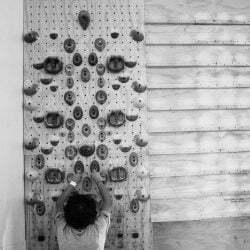 Keep OVERLOAD in mind at all times, and understand that you probably won’t be a better climber right at the end of this phase…you’re simply laying down the foundation for big improvements later in the season. Wow! First exposure to this site, and I really like it already! I am nearly 61, have not climbed hard for quite some years, and am just solidifying a period of enhanced fitness after some extended years of grief/loss with consequent weight gain and few fitness forays. My background is primarily triathlon, but the cardio clearly suffered from 2013-2016. The last two years have been better with a good base of cycling. Now I am slowly building forearm strength and endurance, and slowly shaving the weight with a LCHF dietary approach. Progress is slow, though very steady! Thanks so much for the incentive of this site; I am really jazzed to be looking at my climbing again, which has always reigned supreme in my interest, passion, and execution. Carpe diem, all, and climb hard, climb safe, and climb inspired!